﻿ How do armor & magic resistance work in League? Calculation formula, armor and mres penetration system, true damage. Armor and Magic Resistance mechanics are the cornerstones of LoL and we will explain how they work in this guide. They work similarly thus we will consider them both at once. Armor and Magic Resistance are characteristics that all units have. They reduce incoming damage each from a particular source (physical and magic accordingly) by percentage. We will combine these two terms into a single one: “resistance” for convenience reasons. Each point of resistance requires an attacker to do 1% extra damage to a target to make a kill. For example, a champion with 50 armor and 1000 health needs 1500 physical damage in total to be slain. This means the effective health of that champion was increased from 1000 HP to 1500 HP against physical attacks. There is simple formula using which you can calculate reduction on your own. Despite that LoL armor and LoL magic resistance working similarly, there is a difference in starting points. Each champion starts with 16-35 armor (to cut it short melee champions get more armor while ranged less) and it grows up with each level up to 65-97 at 18 level ( Gnar has 65,5 armor and Maokai 96,7). The only champion who doesn’t gain armor per level is Thresh due to his passive ability Damnation which increases his armor for collected soul instead. Magic resistance starting point always equals 30 and only melee champions gain it per level. However, there are a few exceptions among melee champions whose magic resistance does not increase with level up: Yasuo, Kassadin, Poppy, Maokai, Shen, Singed. Champions who are able to change their forms from melee to ranged and back also do not gain magic resistance per level, e.g Nidalee or Jayce. Armor and Magic Resistance are working great with shields since they increase their effectiveness, e.g. 250 HP shield on 100 MR would provide 500 effective health against magic damage. Also, I want to highlight such item as Seeker’s Armguard, that increase armor by 30 but also increase armor by 0.5 for each slain minion, up to 15 additional armor. Mostly Seeker’s Armguard is a Mage’s artifact because it can be upgraded in Zhonya’s Hourglass later. Among the magic resistance items each champion can find something unique for himself. Mages prefer Abyssal Mask or Athene’s Unholy Grail. If you have no defensive items yet most times it would be better to start with health item first. 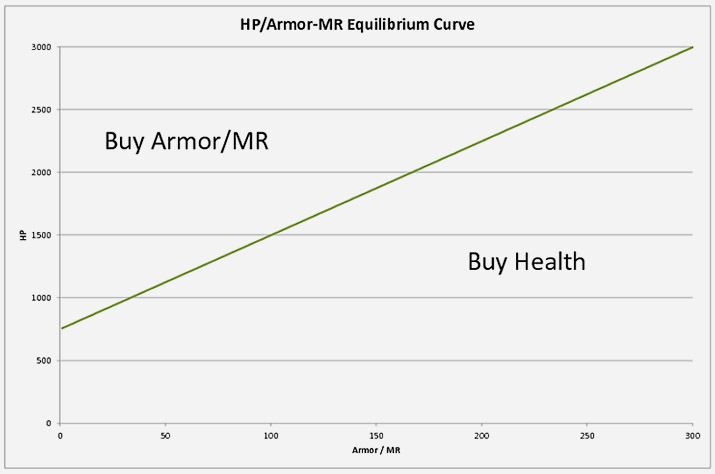 However, at champion levels above 10, you should consider buying armor/magic resistance (check graph). Braum’s Stand Behind Me ability greatly increase magical and physical resistance. Leona’s Eclipse covers under the shield for 3 seconds and for this time her physical and magical resistance are increased. Thresh’s Damnation increases his defense by 0.75 points for each soul he consumes in his lantern. As you can see most of these abilities increase both magical and physical resistance. And another thing – the damage of some champions depends on the armor, like Taric’s Shatter or Malphite’s Ground Slam. Here I want to tell about some useless, but still interesting info about some champions and their synergy with some artifacts and masteries. Thresh with his passive ability Damnation, can increase his armor, and if you want to play a very long game, then look at this champion. Btw, you can not increase your physical armor at 100%. Malphite with 6 Thornmails, all defensive talents, and under abilities: Brutal Strikes, Bulwark, Command: Protect and Shatter can bust his physical resistance up to 1643 points. Trundle with the same artifacts as Malphite in the previous example can use his ultimate on Malphite and in this case, his physical armor will reach 1790 point, and this is around of 95% of physical defense. Apart from items that provide resistances, there are items that counter armor and magic resistance of your enemy. Such items have armor penetration or magic penetration record on them. Armor penetration decreases armor of the target, and if your champion has 10% of armor penetration this means that you will deal 10% more damage. But in LoL, we have 2 options – Armor Penetration and Armor Reduction. The only difference between them is that Armor reduction will reduce armor even if an enemy has no armor at all. You can decrease his armor lower than 0, and in this case, an enemy will receive a bonus damage. In the Season 7 was added a new indicator – Lethality that replaced old Armor penetration. Lethality increases armor penetration by 40% of its basic amount and rests 60% depends on the level of the target. It looks very hard, but in fact, this means that Lethality at the early stages of the game is not that effective as armor penetration was, but in the late game it will be as effective as old armor penetration. All champions have 0 penetration from the beginning of the game, but it can be increased by various runes, talents, items and champion abilities. There are two kinds of penetration in LoL: percentage and flat. Percentage penetration always goes first in calculations. Example: Imagine that a champion who has Last whisper (provides 35% armor penetration) and The Brutalizer (provides 10 flat armor penetration) attacks a target who has 200 armor. Champion would attack as if the target had 200*0,65-10=120 armor. If we use formula listed above we can calculate that champion would deal 45% of his total physical damage instead of 33% that he would have dealt if he had no penetration at all. Percentage penetration stacks multiplicatively. It can be roughly described as each successive source gives less effect than its absolute value, e.g 35% magic penetration from Void Staff and 6% from Devastating strike mastery lead to 100-0,65*0,94=39% magic penetration (not 41% as if it would stack additively). You can check it yourself by opening champion sheet in the game (Hotkey “C“). Penetration in LoL allows you to do true damage to the enemy but not more than that. If you have 40 flat armor penetration and your enemy has 30 armor, you’re still going to do damage as if the enemy has 0 armor (not -10). Even if it named slightly differently, it still works in the same way, despite the fact that in calculations in goes before penetration. LoL has only one item that provides the effect of the armor reduction – The Black Cleaver. Lethality is calculated by the next formula – (0.6 + 0.4 * Target’s Level / 18). From the formula, we can see that the Lethality will work better in the late game, where everyone will have the same 18 level. For example, if an enemy has 18 level, you have 20 Lethality and attacking an enemy that has 30 armor, the damage will be dealt like he has only 10 armor. Armor of most monsters jungle varies from 6 to 15, therefore, it’s better to have attack damage runes. Mastery Devastating strike gives up to 6% of armor and magic penetration. Apart from items and masteries you can receive resistance penetration from runes. Armor penetration doesn’t work on turrets. There is the instructional video about the difference between attack damage and armor penetration in LoL with detailed numbers and calculations. We recommend you to watch it. 39% armor penetration: Last Whisper and Battering Blows. 58.86 flat magic penetration: 0.87 * 9 (Mark of penetration) + 2.01 * 3 (Quintessence of Penetration), 15 from Haunting Guise or Liandry’s Torment and Sorcerer’s Shoes. 39% armor penetration: Void Staff and Devastating strike. Aside from penetration, there are armor and magic resistance reduction in LoL. You can get only magic resistance reduction of flat type from items. There are two differences between reduction and flat penetration: reduction goes first in calculations and it works globally (it decreases stats of the target and all allies deal increased damage while penetration helps only you). Example: Imagine that Ryze who has Abyssal Scepter (provides 20 magic reduction aura), Haunting Guise (provides 10 flat magic penetration) and Void Staff (provides 35% magic penetration) casts rank 5 Spell Flux ( 24 magic reduction) attacks a target who has 184 magic resistance. Champion would deal damage as if the target had (160-20-24)*0,65-10=81 magic resistance. If we use formula listed above we can calculate that champion would deal 55% of his total magic damage instead of 38% in case he had no penetration and reduction at all. There are only one item in LoL that provide armor reduction – The Black Cleaver. Abilities that provide flat reduction of armor are: Gatling Gun (up to 40 armor reduction at 5 rank), Spirit Fire (up to 40 armor reduction at 5 rank), Puncturing Taunt (up to 30 armor reduction at 5 rank), Shatter (up to 25 + 5% of Taric’s armor in armor reduction at 5 rank). Abilities that provide percentage reduction of armor are: Dragon Strike (up to 26% reduction at 5 rank), Slice and Dice (up to 35% reduction at 5 rank), Roar of the Slayer (20% armor reduction), Noxian Corrosive Charge (up to 20% reduction at 5 rank), Denting Blows (20% armor reduction), Challenge (15% armor reduction), Crushing Blow (up to 30% armor reduction at 5 rank). Abilities that provide flat reduction of magic resistance are: Spell Flux (up to 24 magic resistance reduction at 5 rank), Dread (10 magic resistance reduction when Fiddlesticks deals magic damage or casts Terrify on a target), Cursed Touch (up to 25 magic resistance reduction on auto attack). Ability that provides percentage reduction of magic resistance is Wall of Pain (15% reduction). Abilities that provide both percentage reduction of armor and magic resistance are: Holy Fervor (up to 15% reduction on 5th hit), Caustic Spittle (up to 28% reduction at 5 rank), Subjugate (up to 40% reduction), Transform: Mercury Cannon (up to 25% reduction at 4 rank). There is a type of damage which allows to ignore resistances of a target or any other form of damage reduction e.g. Alistar‘s Unbreakable Will. Summoner spells Ignite and Smite also deal true damage. DOES TRUE DAMAGE IGNORE SHIELDS? You need to know that true damage doesn’t penetrate spell or ordinary shields, e.g. Cho’Gath’s Feast won’t deal damage to Nocturne if he has Shroud of Darkness effect. Ignite is an exception and can’t be blocked by spell shields however it would be absorbed by any ordinary shield, e.g. Lee Sin’s Safeguard. Red Brambleback provides Crest of Cinders buff for 120 seconds which makes your auto attacks slow enemy movement speed by 8-15% for melee champions and 5-10% for ranged champions. Slow amount depends on level of champion and increases two times at 6 and 11 levels. Also, Crest of Cinders makes target burn for 3 seconds dealing 8 + 2 x level true damage per second. If the buff holder is slain, this buff is transferred to the killer. In this case, the duration is refreshed. Additionally, regenerates 1% of maximum HP every 5 seconds. Spell vamp works with any ability which deals true damage however life steal has no interaction with true damage at all. No, true damage can’t deal critical strikes. DOES EXHAUST AFFECT TRUE DAMAGE? No, true damage can’t be reduced. Great article! One adjustment though: Fiddlesticks’ passive gives magic pen. Here reads lowest base armor is 20. Thresh has 18 base armor so fix that. Nice guide, it’s good to know certain HP when you have to buy armor or magic resistance. Also seems like you don’t need to know much about lol armor mechanics: if you see lots of armor – buy last whisper, magic resist – void staff. If you see few – then it’s up to you to buy Brutalizer or Haunting Guise. I rush 100 armor when i’m playing at top against ad top laner, especially if i have sustain. Very often it allows me to dominate the lane. Wow, that a whole article dedicated to the Armor and the Magic Resist in LOL. Well, this is good. But if you see that enemies just stacking armor penetration items, does not this reduce the overall value of armor and magic defence? In these cases i prefeк just stacking HP and just buy one or two defencive items, just to feel safer.